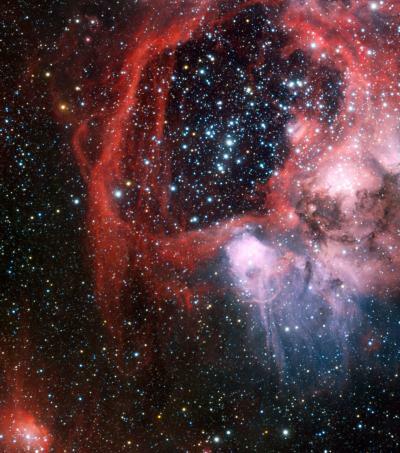 The Large Magellanic Cloud is a small neighbouring galaxy to the Milky Way. It contains many regions where clouds of gas and dust are forming new stars. One such region, surrounding the star cluster NGC 1929, is shown in close-up in this new image from ESO‘s Very Large Telescope. This nebula is officially known as LHA 120–N 44, or just N 44 for short. Hot young stars in NGC 1929 are emitting intense ultraviolet light and causing the gas to glow. This effect highlights the aptly-named superbubble, a vast shell of material around 325 by 250 light-years across. For comparison, the nearest star to our Sun is just over four light-years distant. The N 44 superbubble has been produced by the combination of two processes. Firstly, stellar winds — streams of charged particles from the very hot and massive stars in the central cluster — cleared out the central region. Then massive cluster stars exploded as supernovae creating shockwaves and pushing the gas out further to form the glowing bubble. The image was created by ESO from observational data identified by Manu Mejias, from Argentina , who participated in ESO‘s Hidden Treasures 2010 astrophotography competition . The competition was organised by ESO in October–November 2010, for everyone who enjoys making beautiful images of the night sky using astronomical data obtained using professional telescopes.